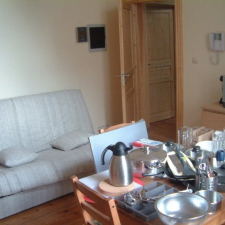 Rent 500 € + 125 € charges (all included: water, electricity, heating, Internet Wifi), deposit 500 €. Flat of 27 sqm., 2nd floor, Fully equipped and furnished. Kitchenette: fridge, electric stove, microwave oven (microwave, convection, grill), odors extractor, coffee machine, sink, cupboards, plates, cups, pots, pans, glasses and everything you need for cooking. IMPORTANT : the bathroom (WC, shower) is outside the flat and is shared with another tenant.